For this ceiling light fixture, Hubbardton Forge chose its natural iron finish to complement the opal glass bowl. Made in the U.S.A., the delicate lines and natural iron finish cradle the focal point of this ceiling light fixture-the 18" diameter opal glass bowl. Part of the Presidio Tryne Collection by Vermont's renowned Hubbardton Forge, this semi-flushmount adds style without overpowering the rest of the room. 18" wide x 16" high. Hand-crafted ceiling light design. 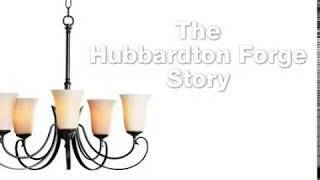 Made in USA by Hubbardton Forge. Can you add a rod to make fixture drop down more than 16 from ceiling? BEST ANSWER: Unfortunately, no additional downrods can be added to this flushmount. I have included the same light in a larger size. ...and stunning design make this light a welcome addition to our home. It took us a while to narrow down our choice to this one and we are glad we did our research and were patient with our selection.[... ]As we are avid do-it-yourselfers, we had the needed wire nuts for installation. It would have been nice, considering the higher-end price of Hubbardton Forge pieces, to include wire nuts. Otherwise we installed it in little under 45 minutes. We are using this fixture in a small bedroom (15 x 12) on a dimmer switch. The size is perfect and we really didn't need the recommended 3-100 watt bulbs to fully illuminate the room. We used 3-60 watt bulbs, which provides more than adequate lighting on the highest end of the dimmer. Overall, a gorgeous, handmade fixture that would work well in a foyer, dining area or bedroom. You won't be disappointed. "Love the look, great functional lamp"!